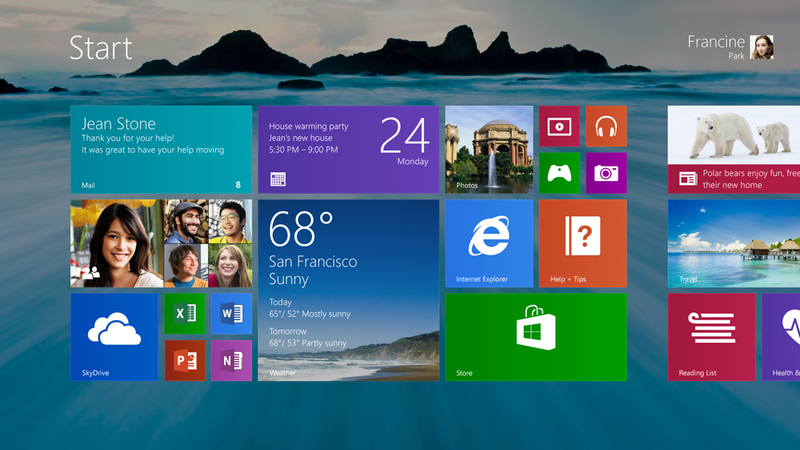 What’s the goal with Windows 8.1? Over the past few months, Microsoft has faced a dilemma: Sales for the company’s touch-centric Windows 8 have been notably weak. Not helping is the fact that the computer industry has struggled overall. Research firm Gartner revealed in April that PC shipments for 2013’s first quarter had dropped to their lowest levels since Q2 of 2009. Many consumers, meanwhile, have regarded Microsoft’s operating system as confusing, lacking apps and not suited for the traditional desktop. Thankfully Microsoft has sought to get its ship sailing in the right direction, opting to release a major update to Windows 8 that addresses some of these gripes. Now featured is a cloud-powered photo stream that delivers pictures from SkyDrive, the user’s computer and mobile device and displays them on the lock screen. PC Settings now features more all-in-one options, allowing users to perform tasks such a setting power options, changing display resolutions, running Windows Update and more without the hassle of accessing the control panel. New tile sizes are in the mix including larger ones (can be used for weather, calendar appointments, etc) along with smaller ones. Photos – Microsoft has worked to improve built in apps including Photos, something that will now allow new adjusting in addition to launching them from Camera, Mail and SkyDrive. Music – Microsoft has redesigned the app to “pick and play music from your collection,” according to Microsoft SVP Antoine Leblond. Users can now hold down on app tiles via the start screen (even multiple ones) and drag and drop them into new and preferred locations. You can also name tile groups as you please. More personalization options are in the mix along with motion accents (For example, Microsoft showcased a dragon that will follow your finger as you swipe throughout the start screen). You can also put the desktop wallpaper behind the start screen. Type in a search query and the user will receive info from the web in an app-like manner. Info pertains to things like attractions, events, links, images and more. However, also featured in search is PC functionality, allowing the user to perform system options. Microsoft is delivering the latest version of IE with Windows 8.1, something that ads more in depth touch functionality, more tabs, device syncing and faster loading. Microsoft is making is easier for users to navigate and operate Windows in the traditional non-touch desktop sense. To do so, the company’s added a Start Button featuring the familiar Windows logo that appears at the bottom left of the screen. This also includes an apps view compared to the tile screen. Users can now view a “SkyDrive/This PC option within every app – something that lets them allocate resources to either one. With the mail app, you can now open the photos app side by side with mail – you can also resize each one’s size. Are these features you’ve wanted to see in Windows 8? Share your thoughts below.